A much awaited human rights abuse trial is underway in Argentina. The accused is a catholic priest charged with carrying out human rights abuses while working in several clandestine detention centers during the nation's 1976-1983 military dictatorship. The priest was arrested four years ago while living under an alias in Chile. This is the latest human rights trial of accused torturers since the landmark conviction of a former police officer for genocide in 2006. Former Chaplin Christian Von Wernich wore a priest's collar and bulletproof vest as he sat behind reinforced glass in a federal court. The court clerk read charges accusing him of collaborating with state security agents and covering up crimes in seven deaths, 31 cases of torture, and 42 cases of illegal imprisonment. He answered basic court questions but refused to testify in the case, stating, "Following the advice of Dr. Jerollini, who is my lawyer, I am not going to make a declaration. And I am not going to accept questions." An estimated 30,000 people were killed during the military junta's reign of terror. As his trial began, hundreds of human rights activists stood outside the courtroom in the city of La Plata to decry Von Wernich as a murderer. President Nestor Kirchner traveled to La Plata and said during a speech that Von Wernich "brought dishonor to the Church, to poor people, and to human rights." At least 120 witnesses are slated to testify against Von Wernich and the court has taken precautions to protect their safety, putting up police fences around the courthouse and installing metal detectors. In the front row of the courtroom's audience, representatives from the human rights organization Mothers of Plaza de Mayo sat with their white headscarves listening to the court's accusations. According to Nora Cortinas, president of the Mothers of Plaza de Mayo's founding chapter, the Catholic Church supported the crimes committed during the dictatorship. "The heads of the Catholic Church participated in the dictatorship. Many priests were chaplains inside the barracks of the concentration camps. We want to point out that there is a sector from the church that didn't have anything to do with the dictatorship, on the contrary they supported us and reported the crimes committed at the time. But most of the representatives from the church participated in the celebration of death and torture," explains Cortinas. Journalist Horacio Verbitsky recently published a book on the Catholic Church's involvement with the military dictatorship. In his book, El Silencio (The Silence), he reports that the Catholic Church actively participated in the 1976-1983 dictatorship while having full knowledge of the human rights violations being committed at the time. In the days leading up to the coup, representatives from the Catholic Church met with leaders of Argentina's armed forced and witnesses report they left each of these meetings smiling. On the eve of the March 24, 1976, coup, military leaders Jorge Videla and Ramón Agosti visited Archbishop Paraná Adolfo Tortolo and Monsignor Victorio Bonamín at the Catholic Church's Vicariato Castrense headquarters. A week later, Tortolo reported, "General Videla adheres to the principles and morals of Christian conduct. As a military leader he is first class, as a Catholic he is extraordinarily sincere and loyal to his faith." He also said that when confronting subversion, the military should take on "hard and violent measures." However, it was during interviews in 1995 with former Marine captain Adolfo Scilingo in which he confessed to Verbitsky having led the "vuelos de muerte" or death flights, that Verbitsky realized the gravity of the Catholic Church's complicity with the military's human rights crimes. Scilingo, who was sentenced to 645 years in prison by a Spanish court, reported that the catholic hierarchy approved drugging dissidents and dropping them from planes into the Atlantic Ocean during the "vuelos de muerte," as a Christian form of death. When Scilingo felt anguished after directing these death flights, he would seek counseling from military chaplains at the ESMA (Spanish acronym for the navy mechanics school), the largest clandestine detention center in Buenos Aires. During the dictatorship, there were representatives from the church who provided refuge for people fleeing from being kidnapped by commando groups and reported the crimes being committed by security commandos. At the same time, they risked their own lives. French nuns, Alice Domon and Léonie Duque, were disappeared and murdered in 1977 for their organizing activities with the poor. Ex-navy captain Alfredo Astiz, also known as the "blond angel of death" is facing trial for the nuns' disappearances along with those of a dozen other people, including Azucena Villaflor, the founder of Mothers of Plaza de Mayo. Villaflor was kidnapped by a commando group in 1977 as she left the Santa Cruz church in Buenos Aires, where family members of the disappeared would clandestinely meet. Humanitarian organizations have reported that during the dictatorship at least 19 priests were disappeared, 11 were kidnapped, tortured, and later released, and 22 were arrested for political reasons. Human rights representatives have demanded that the Catholic Church issue an apology for the victims during Argentina's so-called "Dirty War." The Catholic Church has refused to issue a statement, other than to confirm that Von Wernich continues in the ranks of the church hierarchy. "Christian Von Wernich is one of the spokesmen from the Church that participated in the tortures and 'comforted' disappeared detainees," said Christina Valdez, whose husband was kidnapped and later disappeared in the provincial capital of La Plata. Witnesses have testified that Von Wernich carried out a special role inside a network of clandestine detention centers known as the "Camps Circuit" in the Buenos Aires suburbs. He is most notorious for his title as "spiritual aid" inside the Puesto Vasco concentration camp, one of the 375 used to disappear, torture, and murder 30,000 people. On just the third day of the trial, a number of witnesses gave remarkable testimonies of Von Wernich's crimes in several clandestine detention centers. Torture survivor Héctor Mariano Ballent testified that the catholic priest would visit detainees in their cells after torture sessions saying, "Come on son, confess everything so they stop torturing you." After Ballent asked from his cell how a priest could condone this type of punishment, Von Wernich left. At least 30 detainees report that they saw Von Wernich inside the Puesto Vasco clandestine detention center. 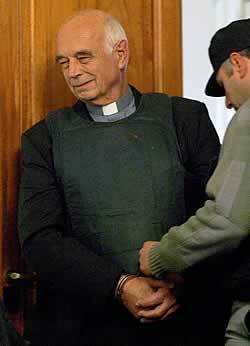 The Catholic Church relocated Von Wernich to Chile at his request to avoid criminal persecution in 1996, just before a series of trials began in La Plata in 1998. He was working as a priest in El Quisco, Chile, under the alias of Christian González, a name the parish gave to him until he was arrested in 2003. Nearly 30 years after Von Wernich committed human rights violations, it is unlikely he will escape conviction, given the amount of evidence and witnesses slated to testify against him. Outside the courthouse, hundreds of human rights advocates rallied, demanding a severe sentence for the priest. At one point, Von Wernich interrupted head judge Carlos Rozanski, saying he couldn't hear the accusations against him because protestors could be heard yelling "assassin" from outside the courtroom. Christina Valdez describes how she felt seeing Von Wernich on trial: "Looking at Von Wernich is looking at the face of a murderer. I suppose that all the relatives of the disappeared must feel a similar sensation: a certain impunity because one has to sit and swallow down everything that he or she feels in that moment. You can't yell at the murderer, you can't scream 'assassin.'" This is only the third human rights trial since Argentina's Supreme Court struck down amnesty laws in 2005 protecting military personnel who served during the seven-year dictatorship. Human rights organizations worry that judicial roadblocks and an atmosphere of fear may provide former members of the military dictatorship a window to escape conviction. Rights representatives have expressed immediate concerns over missing witness Julio Lopez; a new name that has been inscribed on the doleful roll call of Argentina's disappeared. Human rights groups in Argentina report that the trials to convict former members of the military dictatorship for human rights abuses have been put on hold and that the wave of threats against witnesses continues. Argentina's federal courts have virtually paralyzed upcoming human rights trials six months after the disappearance of Julio Lopez—a key witness who helped convict a former police officer for life. Lopez went missing Sept. 18, 2006, the eve of the landmark conviction of Miguel Etchecolatz, the first military officer to be tried for crimes against humanity and genocide. Only a handful of former military officers have been tried for their human rights abuses during the military dictatorship. In April, a federal court revoked a 1990 pardon for two of the leaders of the former dictatorship, Jorge Videla and Emilio Massera, although it is unlikely that the former dictators will serve any part of the life sentences they received in 1985. Etchecolatz is only the second military officer to be charged and convicted for human rights abuses since 2005, when Argentina's Supreme Court struck down immunity laws for former officers of the military dictatorship as unconstitutional. Etchecolatz was arrested and sentenced to 23 years in 1986, but was later freed when the "full stop" and "due obedience" laws implemented in the early 1990's made successful prosecution of ex-military leaders for human rights abuses virtually impossible. In total, 256 former military personnel and members of the military government have been accused of human rights crimes and are now awaiting trial. However, this adds up to less than one ex-military officer for each of the country's 375 clandestine detention centers that were used to torture and forcefully disappear people. Aside from numbers, human rights representatives report that the trials are advancing at a snail's pace, if advancing at all. Victims blame an inefficient court system filled with structural bureaucratic roadblocks and uncooperative judges. Nora Cortinas says that Argentines do not wish to live with a justice system that permits impunity: "What we want is for the trials to speed up a little bit and not be tried on a case by case basis, and that the government takes responsibility to help end the threats against witnesses, judges, and lawyers, so that we can really say that there's justice in this country." Von Wernich's trial is expected to go on for two months. Human rights groups are preparing events to demand the safe return of Julio Lopez as the year anniversary of his disappearance nears. Marie Trigona is a journalist based in Argentina and writes regularly for the Americas Program (www.americaspolicy.org).